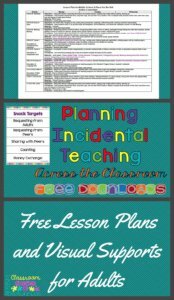 So, I’ve talked about examples of incidental teaching or naturalistic instruction as well as 5 specific targets that fit with 5 common classroom activities. Today I want to wrap up talking about incidental teaching / naturalistic instruction by addressing how to get all of the staff working on the same targets in the same place (and remembering to facilitate the skills in the midst of everything else we have to do). There are four different ways that I use to help assure that everyone knows what to address in each area of the room so I want to share those with you today. The first step I always use to help the staff in the classroom know what needs to be done and taught and where is the staff zoning plan. I’ve written about zoning plans frequently and you can a post with links to them here as well as get a link to download a free form for creating your own. 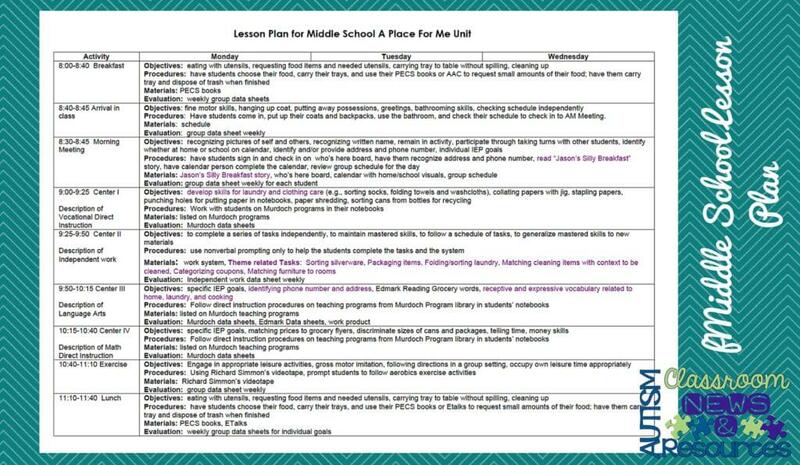 Essentially a zoning plan is a schedule for staff and I like to include reminders to staff within them as well including things like who takes the walkie-talkie when we leave the classroom and which students need facilitation during a group activity. 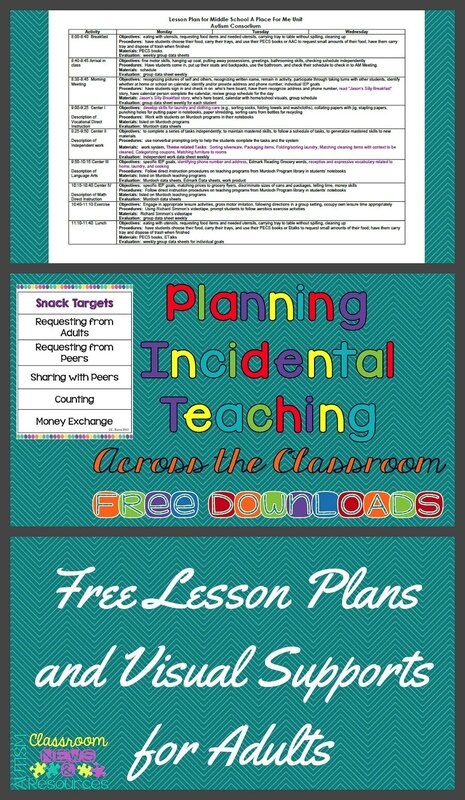 I have not shared lesson plans on the blog before (I don’t think), in part because I don’t like to freak people out. So, Don’t Freak Out! Please understand that my lesson plans are pretty detailed; however once you do them and get them set up, there is limited amount that actually has to change from week to week. You can see that they are set up by the schedule. Each activity has Objectives, Procedures, Materials, and Evaluation. 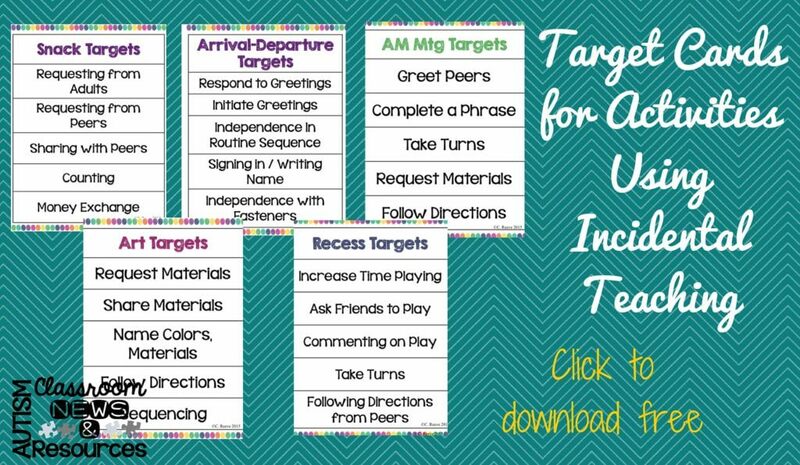 This allows a space to talk about the targets that are being taught for the activity in general. 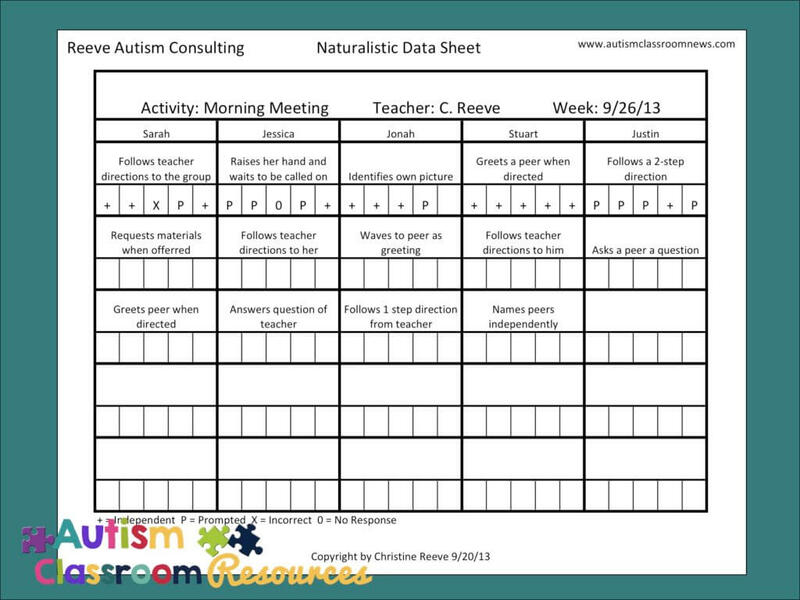 It also lets staff know how to complete the activity, what materials to have ready and what data needs to be collected. Generally the objectives of an activity don’t change much over time and some activities have fixed activities (like the morning meeting routine). The pictures are two examples…the colored text on the middle school one and the highlighted text on the preschool example is highlighting the parts that would change over time. 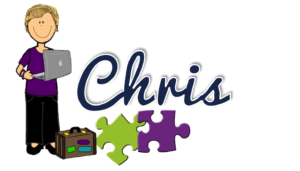 If the lesson plans interest you and you have questions, please feel free to ask and I’ll be happy to share more about them in the future to answer questions. The numbers next to the students’ names under independent work refer to the numbers on the work baskets so that staff knows which ones to set up for each student. Typically, but not always, we have the same work baskets for a week before switching. 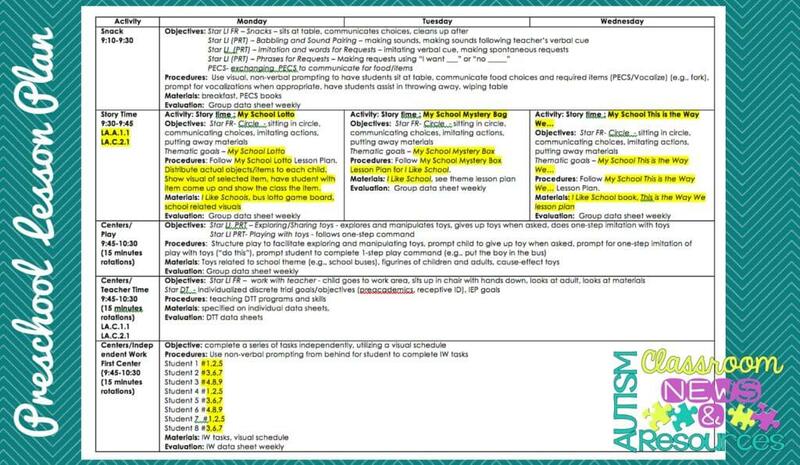 In the meantime, you can download a word document of the middle school and preschool example so you can use the format if you would like it. All I ask is that you keep the credit on the bottom and that you don’t share it these lesson plans beyond your school without asking me. You can send others interested in getting a copy back to this site. And you can share lesson plans you created in the same format, though if you share them I would love a shout back but it’s not required. Click Here to Download Preschool and to Download Middle School documents. I also use data sheets to help staff remember what skills to teach in each activity. The group data sheet that I’ve shared here in the past is a good example of that in that it lists all the students and the targeted skills. You can read more about this data sheet and download a free one here. And finally, you know how much I like visual cues as reminders for adults as well as students…and if you don’t know you can read about it here. I like to tape these on the table or somewhere in the area for each activity as a reminder. I made them in the same format as my Visual Reminders for Special Education Staff that is available in my store. That product also has blanks if you want to make your own with the same template. Click the picture to download them. So those are 4 ways that I set up the classroom to assure that everyone is on the same page. Please share strategies you use in the comments. Want more ideas about lesson planning, drop me a line and I will try to answer them and address them in later posts. The more I read and see concerning teaching elementary students with special needs, I begin to become so happy and not afraid. I love our students and so excited to be able to select from so many awesome tools so that I can definitely make an awesome learning environment!! I can’t wait and welcome my students to OUR NEW CLASSROOM!!! Thank you so much Valerie! Good luck in your journey! !